Hot Rods - Sedan Delivery and Panel Truck picture thread | Page 18 | The H.A.M.B. Need a. “Like them all!” Key. Ron Funkhouser, Bowtie Coupe, loudbang and 4 others like this. porkshop, Ron Funkhouser, Bowtie Coupe and 3 others like this. cruiserjohn76, loner1, i.rant and 11 others like this. Is this a Packard? Hearse or ambulance? I am Butch/566sedandelivery. Yep Packard I was hoping someone here knew what it was LOL. chryslerfan55 and Bowtie Coupe like this. loner1, chryslerfan55, Ron Funkhouser and 4 others like this. Amby, cruiserjohn76, loner1 and 7 others like this. 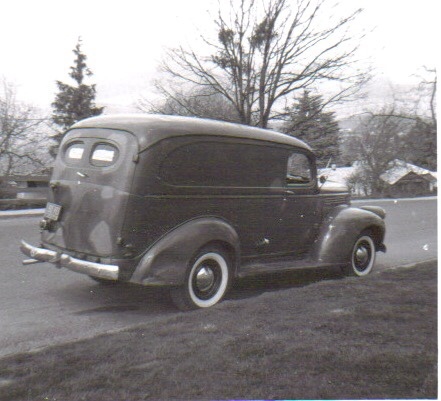 My first auto was a 1946 Chevy Panel Truck. That’s my 50 year old daughter’s mother in the truck in 1967.
chryslerfan55, Ron Funkhouser, 1947knuck and 3 others like this. loner1, chryslerfan55, Bowtie Coupe and 3 others like this. loner1, Amby, chryslerfan55 and 5 others like this. The red '60 Chevy is killer. chryslerfan55, Bowtie Coupe, loudbang and 2 others like this. loner1, chryslerfan55, Deuces and 3 others like this. cruiserjohn76, loner1, Bowtie Coupe and 1 other person like this. 1955 Chevy 1T ex-railroad vehicle. chryslerfan55, Bowtie Coupe and Deuces like this. cruiserjohn76, loner1, chryslerfan55 and 4 others like this. I was not thinking of all of them just this one's back window doesn't look "Correct" somehow. loner1, chryslerfan55, Bowtie Coupe and 4 others like this.